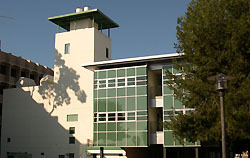 The Mitsubishi Chemical Center for Advanced Materials (MC-CAM) at the University of California Santa Barbara was established in 2001 to enable a research partnership between the Mitsubishi Chemical Corporation (MCC) and the UCSB materials science community. MC-CAM research targets the areas of organic and hybrid organic-inorganic materials for electronic and optical device applications. MC-CAM is located in a 7,000 square foot addition to the Materials Research Laboratory (MRL) Building, which was partially funded by indirect cost recovery on the program. The addition houses the MC-CAM administration and provides space for visitors, research staff and conference facilities.